Create APIs from Enterprise Data. No code required. Create APIs from existing enterprise data. Hook up any data source and instantly generate flexible, comprehensive, and fully documented APIs. 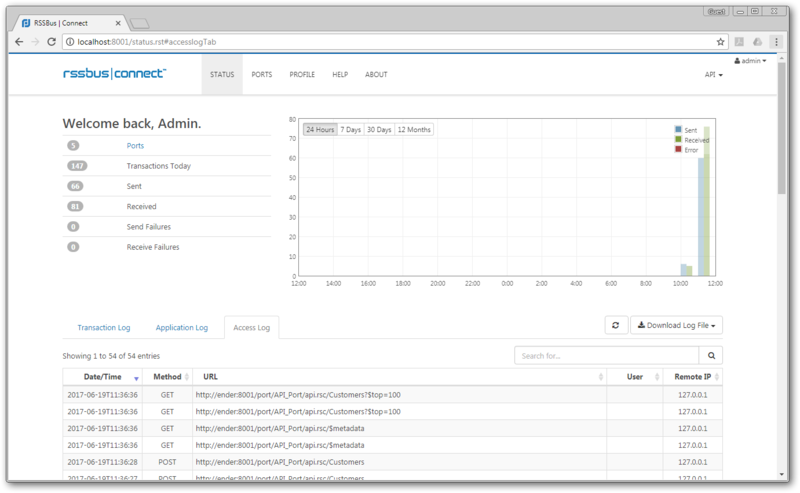 Includes critical API management features like monitoring, logging, rate limiting, etc. 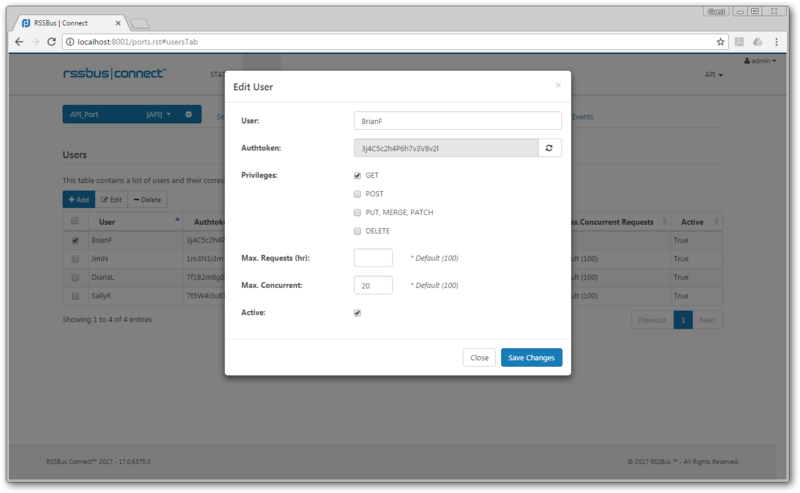 Publish APIs to any platform - on Intranets, public-facing servers, or in the Cloud! Unleash the integration potential of your data. The fastest and easiest way to unlock IT assets and digital resources though professional APIs. Whether your organization wants to leverage APIs as a growth catalyst to build an extensive third-party ecosystem, or your focus is on solutions for corporate IT, RSSBus Connect is for you. Create fully-documented, discoverable APIs based-on OpenAPI. 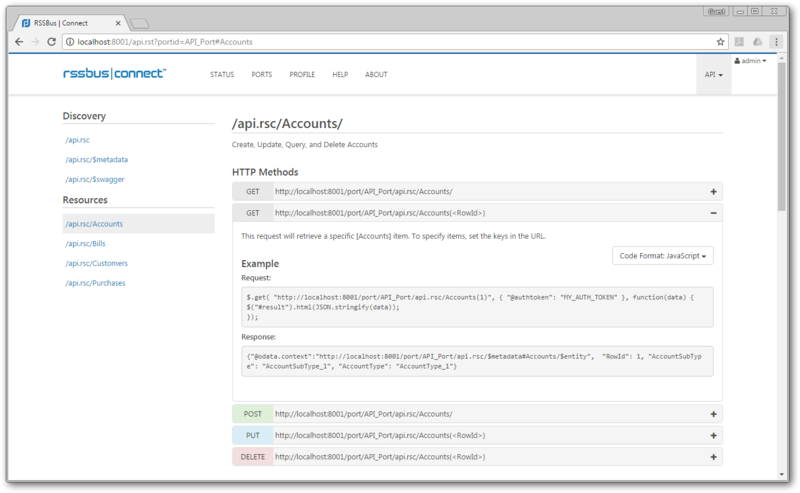 Fine-grained control over security, user access, and API management features. Enterprise-class security with strong SSL encryption, user management, and access control. 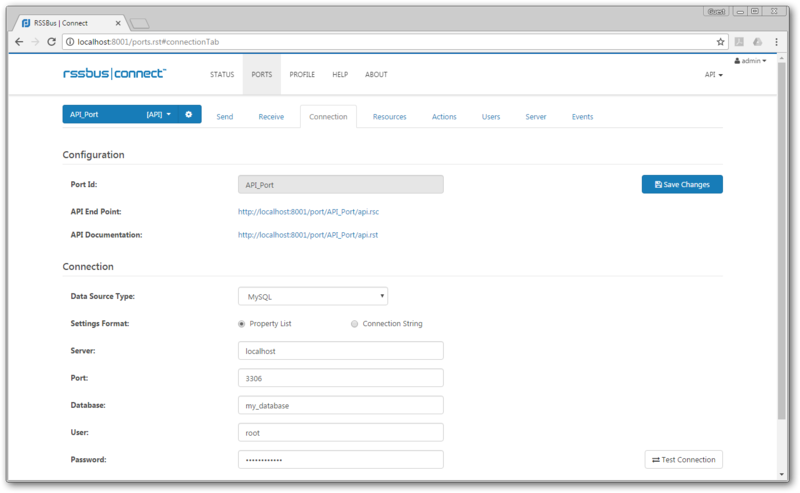 RSSBus Connect is the tool you need to publish enterprise-ready REST APIs in minutes - no custom development required. Connect to your Database / Data Source. Define security (authentication and permissions). Expose your API: Locally, or in the Cloud. Connect to any database and select tables. Define users and access controls. Expose professional REST APIs based on OpenAPI. Service & User-level API activity monitoring. Connect Through OData. The OData protocol is widely supported by developer tools and there are dozens of client libraries available for working with OData from .NET, Java, PHP, Objective-C, etc. Connect Through Other Modern Web APIs. Unmatched power and flexibility in integrating with other systems and applications. Many interfaces are accessible through simple standards-based protocols like SOAP, REST, HTML, ATOM, JSON, XLS, CSV, and More! Secure Data Access. RSSBus Connect offers powerful security and access management capabilities including integrated transaction monitoring, management, and data access controls. All communications channels are secured by strong SSL security. Highly Extensible Design. The RSSBus Connect exposes dozens of services that are easily accessible through simple standards-based interfaces like SOAP, REST, HTML, RSS, ATOM, JSON, XLS, and CSV. Connect From Microsoft Power BI & Excel. Users can connect Microsoft Power BI directly to OData Sources. Specify the URL of the OData service created by RSSBus Connect, and the application will load data. The returned data can be processed and visualized by anyone - no developer required. Bi-Directional Access to Live Data. RSSBus Connect offers full Create, Read, Update, Delete (CRUD) support for integrating with live back-end data. Integrated Data Caching Capabilities. Smart caching capabilities provide unmatched performance, enabling a highly responsive data access layer for client applications. Entirely Self-Contained. No Additional Components Required. Run as a standalone Web Application, embedded within Microsoft IIS, or from any Java compatible Web Server for secure management from anywhere. On-Premise, Or In The Cloud. Designed to perform equally well hosted on premise (Windows, Unix / Linux, Mac OS), or in the Cloud (Azure, Amazon, Google). Expose and connect-to data regardless of network topology, hardware, or software requirements.